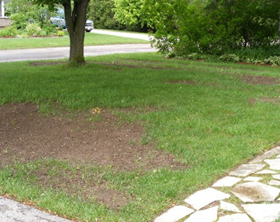 First, rake out any dead grass from the area to be seeded. Apply a light covering of soil and scatter grass seed on the surface. Rake the seed into the soil and roll or press to become firm. Keep seeded areas moist. 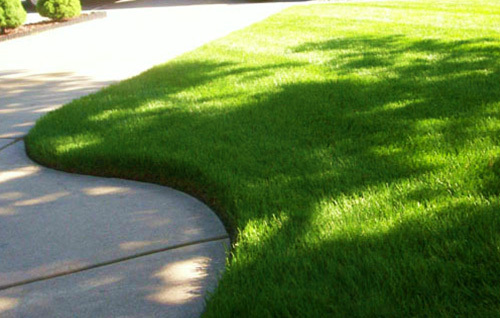 Avoid applying weed controls until the new grass has been mowed 2 or 3 times. Mow normally in the seeded areas. Don’t let the new grass get too high. Mowing at normal height will help new grass fill in. Water is essential for success. Keep the area moist until well germinated–plan to water throughout most of the summer. Grass plants take a couple of years to fully develop their roots and need extra water during hot, dry weather. Be sure to use the proper grass seed mix – a Sun blend or a Shade blend as required.